Decision making software for robust decision analysis with Normative Decision Theories. Rational Will is a set of Decision-making tools that comes with Decision Tree, Analytic Hierarchy Process, Decision Matrix, Markov Decision Process, Markov Chain, Influence Diagram and Pros Cons Analysis. Also, it comes with a Bayesian Inference based experimentation tool. Based on your attitude towards risk, get a policy from a Decision Tree and know what action to take at what situation; Always have your plan-B ready before jumping to an action; Use multi-criteria attributes for Pay off. Use advanced utility functions, various metric analysis like Stochastic Dominance, Value at Risk, etc. Super intuitive GUI, so no need to spend time learning thru documentation, rather jump start using the rich User Interface. Multi-Criteria / Multi Objective decision analysis. You can model Rewards at an option or an event with Multiple-criteria Utilities. Rational Will Objectives can encapsulate rich information, like the attribute type of the objective. For example, some attributes can be Boolean Type (yes/no or true/false), some of them can be a Subjective type, Number type, or Categorical. Monetary type objective can be used to calculate Net Present Value using an interest rate. When you have a probability distribution, Monte Carlo Simulation is performed automatically without asking you anything to configure. Whenever you have uncertainty, the Risk Profile chart is generated for you to visualize the complete possibilities of uncertain events and realize what can go wrong. Get prepared accordingly. In the same Risk Profile chart, view Cumulative Probability Distribution and Survival Function charts for getting different perspectives of the scenarios. Realize the risks in any action you take. Observe a plethora of risk metric charts including Value at Risk, Entropy, Baumol's Risk measure, Domar and Musgrave Risk Index, Roy's safety first rule, Shortfall VaR, Variance, Standard Deviation etc. Try the analytic hierarchy process feature, and you will be amazed. Advanced guided wizard user interface is offered to model the Analytic Hierarchy Process. Rational will uses Eigenvalues and eigenvectors for calculating priorities from Pairwise Comparisons. Enforce Transitivity Rule - and save yourself from doing misjudgment. When performing a pairwise comparison, you can misjudge 2 factors by not being consistent. Enforce Transitivity Rule and save you from doing such mistakes. Transitivity rule is a quality of judgment. One big benefit of enforcing the transitivity rule is that the number of pair comparison will be dramatically reduced. More technically speaking, the number of Pair Comparison will be reduced to N -1, where, without transitivity rule, the number of pairwise comparisons is ½ * N * (N - 1). That can be a huge time saver for you. Consistency Ratio - get a feedback on how consistent you are. Consistency Ratio is also calculated and displayed in a pairwise comparison view. The higher the number is, the more inconsistent you are. The Rational Will computes a strategy based on your Attitude. If you acknowledge as a realist rational person, the Von Neumann–Morgenstern utility theorem - Maximize Expected Utility approach will be used. If you are a very pessimist person who wants to avoid all kind of risks, you can choose LexiMin approach. If you regret opportunities, then the Minimax Regret approach is available for you. Hurwicz’s Optimism Pessimism rule is also available along with various customizations. Extensive modeling of a Utility function. Rational Will has an extensive coverage on Von Neumann–Morgenstern Utility Theorem. Model your Utility function as many ways as possible using our rich visual drag and move chart editor. You can directly use the Exponential Utility Function, or Bernoulli Utility Function as well. Finally, use custom expressions if any of the built-in models won't suit your taste. Utility Function elicitation thru game playing. If you are not sure about your utility function, a Certainty Equivalent based Game can be offered to you. While you play the game, the 'Rational Will' will infer your Utility Function using the concept from Behavioral Economics. Modeling Probability Distribution with an option to truncate. You can model from a simple to a very complex probability distribution for any variable. You can even use custom expressions like f(x) to model your custom distribution. You can model uncertain chances where both of them can happen at the same time. Do not know the probabilities? No worries. In real life, it is really not feasible to probabilities of uncertainties. Rational Will can infer the unknown probabilities by applying the Principle of Insufficient Reasons. Bayesian Inference - update your beliefs by Experimentation. Whenever you model an uncertainty, you can update your beliefs based on experimentation and observations. A built-in Bayesian Inference tool called Diachronic Interpretation is ready for you to help you elicit the probabilities whenever you need. Stochastic Dominance: (Up to the 3rd order). When you compare random variables, Stochastic Dominance measure should be considered to rank the variables. 'Rational Will' can calculate Stochastic Dominance up to the 3rd Order. Whenever a model contains Uncertainty, the stochastic dominance is calculated in the Result Panel. Using Markov Decision Process, model your repeatable situations and get a policy of actions to do in a given situation. Finally, the Markov Decision Process Policy Graph is automatically created for you from the model you created. Again, from a repeatable situation, using a Markov Chain, forecast the next state. Jot down your problem quickly using an Influence Diagram. The benefit to Cost ratio with Net Present Value. Using the MiniMax Regret analysis, choose an action that minimizes the maximum amount of regret. See, at most how much you can regret an opportunity if you choose an action. Rational will is equipped with an intuitive wizard that follows a regular thinking pattern and captures your objective. Even, when you are analyzing simple Pros and Cons, using the Heuristic Analysis, get the guidance about which cons should not be included, as sounds like it is just a missing Pro, not really a Con. Finally, it is a deep realization of the Normative Decision Theories. Rational Will is a decision-making software realizing the Normative Decision Theories. 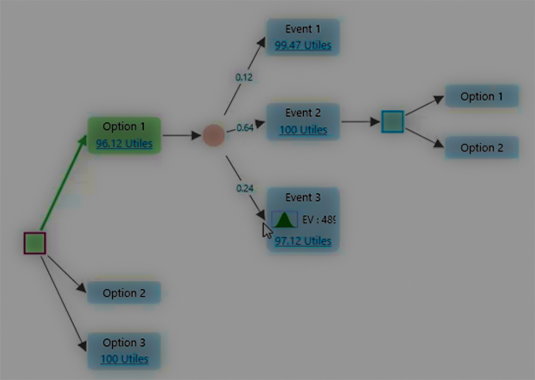 Rational will incorporates various decision analysis methods like Decision Tree, Analytic Hierarchy Process, Decision Matrix, Markov Decision Process, Influence Diagram and Pros Cons Analysis. How to decide if you should take a promotion from your mobile phone company. Why care about Rational Decision Making?